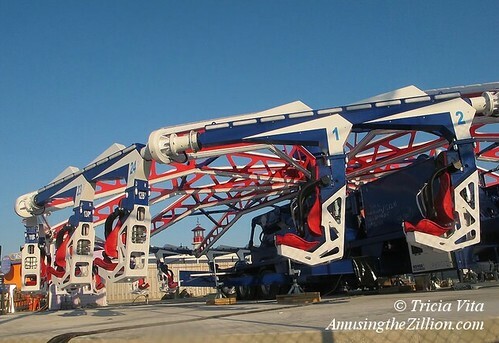 A new Enterprise-style ride called the Endeavor has been on Luna Park Coney Island’s map–“Coming Soon! Get ready for an experience that is out of this world” — and ATZ’s radar since the park opened this spring. But the newly built ride has yet to arrive in Coney and a photo of what it looks like has not been seen till now. 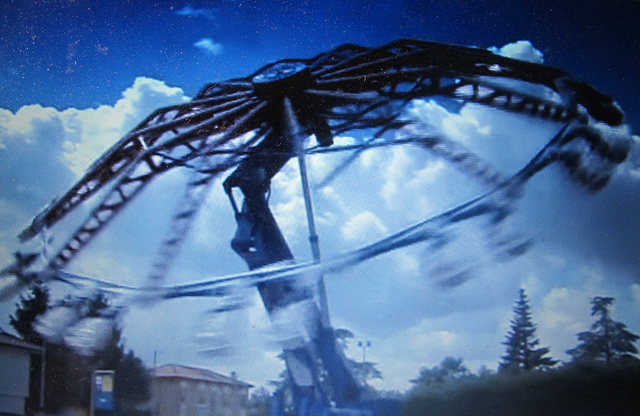 Thanks to a tipster for alerting us to a video tour of Italian ride factories including Zamperla’s Soriani factory, in which the ride is seen in action for about a minute from 2:59 in the video below. 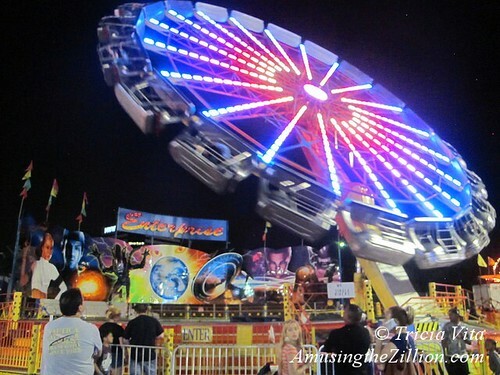 ATZ’s source says the new ride is en route to Coney Island, where it is expected to debut within the next six weeks. What will ride aficionados have to say about the ride experience compared to the classic Enterpise and how long will the operator keep the ride in a vertical spin? The Enterprise, which first came out in 1972, was named after the Star Trek Starship. 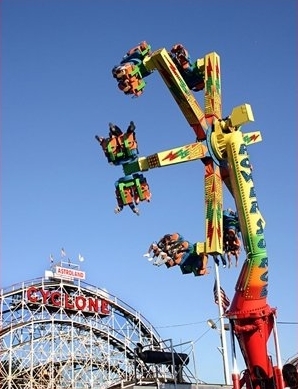 Manufactured by Huss, the spinning thrill ride was a fave at Coney Island’s Astroland from the 1970s until the early 2000’s when it was sold to New Jersey’s Casino Pier. Lake Compounce, Dorney Park and Strates Shows are among the owners of the 20 or so Enterprises operating in the U.S. today. Two icons of American air and space history meet in Eric Kowalsky’s awesome photo of the Space Shuttle Enterprise flying over the Parachute Jump. 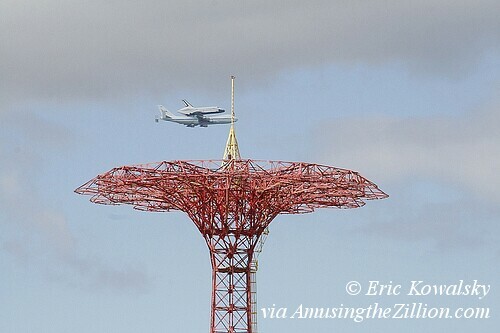 On Friday, the Coney Island photographer captured the moment when the Space Shuttle flew over Brooklyn’s landmark tower. Originally designed by retired Naval commander James Hale Strong to train military paratroopers in the 1930s, parachute towers were modified into amusement attractions when civilians clamored to ride. Strong’s Parachute Jump became a popular attraction at Coney Island’s Steeplechase Park after moving here from the 1939-40 New York World’s Fair. Though the ride hasn’t been in operation since the park closed in 1964, “Brooklyn’s Eiffel Tower” is an official New York City landmark. The Space Shuttle Enterprise was the first Space Shuttle Orbiter. Named after the fictional Enterprise in “Star Trek,” it was designed to take off like a rocket and land like a plane. The Space Shuttle flew on its own for the first time in 1977 and was retired to the Smithsonian’s Air and Space Museum in 1985. Ferried by a jet, the Space Shuttle made a final, 45-minute flight over the Hudson and several New York City landmarks before landing at JFK. Its new home will be the Intrepid Sea, Air and Space Museum on Manhattan’s West side.